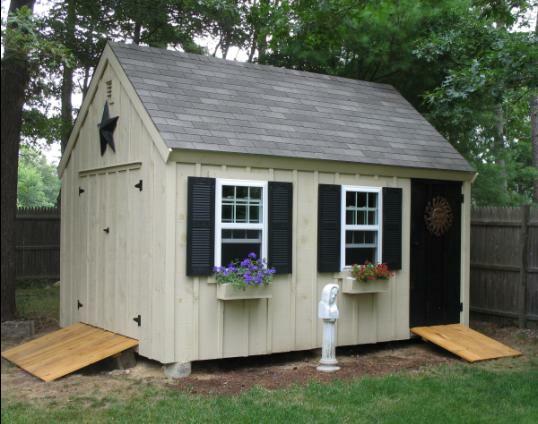 What is a Cape Cod style shed? 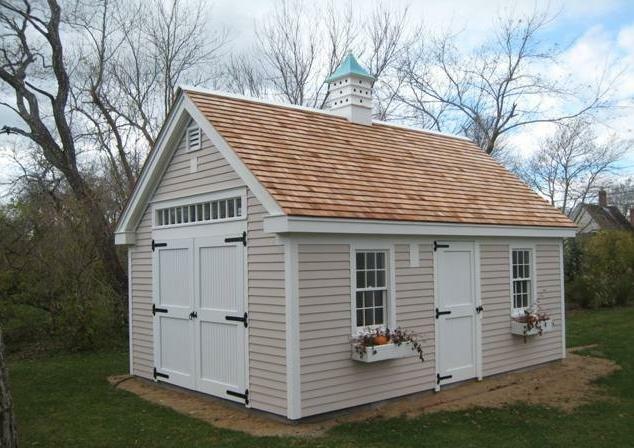 Modeled after the Cape Cod style house, Cape Cod sheds share many of the same characteristics. A Cape Cod shed is an even pitch style shed. Just like a Cape Cod style house, these buildings follow the common Cape Cod pattern, a low, broad frame building, with a steep, perfectly pitched roof. 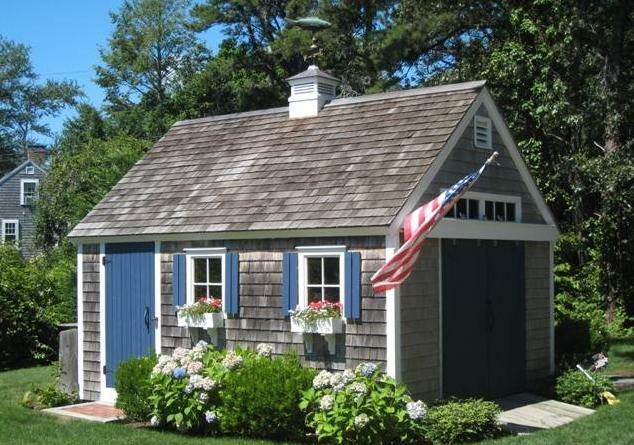 Below is a textbook Cape Cod style shed, built to look like a small Cape Cod style house. In fact this one looks alot like a miniature Cape half-house. The Cape Cod shed above has cedar shingle siding which weathers to a silver/gray color. The roof on this one is done with cedar shingles as well. It has two 4-lite stationary windows, a 3’ passage door made from beadboard pine, a 6’ sliding barn door with a transom window on the gable end and a cupola with a namesake Codfish weathervane. The Cape Cod shed is also reminiscent of the typical fishing shanty that has dotted the shores of New England for over 300 years. These were low, broad buildings with a relatively steep 10 or 12 pitch roof designed to maximize loft storage and "shed" snow during the cold New England winters. 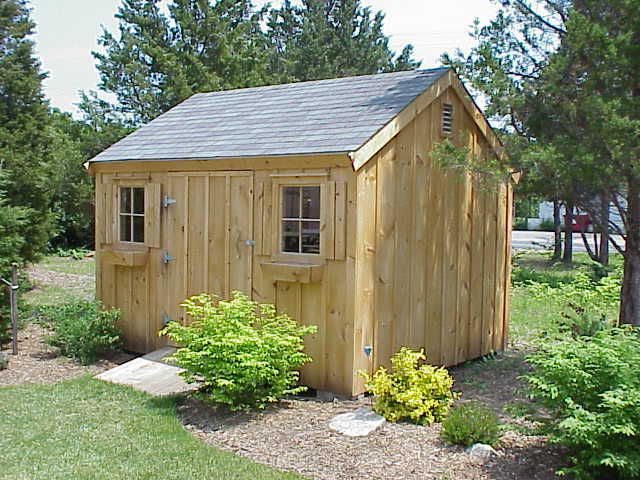 The basic Cape Cod shed is finished in board and batten siding like the one below. This shed also has an 8 pitch roof which is less steep and does not offer as much loft space as a steeper 10 or 12 pitch roof. As well as being a simple finish, board and batten siding conveniently allows for finished siding to be installed later on. 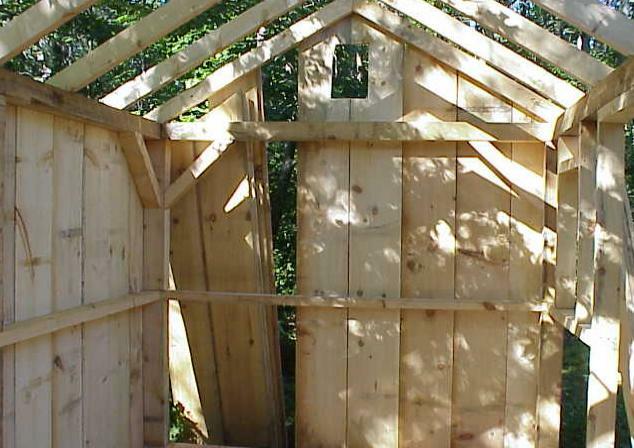 You can simply remove the battens and finish the building with any siding. The board and batten siding can also be painted with solid color stain like the building below. The plastic shutters also give it an easy finished look. The interior of the Cape Cod post and beam shed is all wood. Typically built from Eastern White Pine, all the lumber is full dimension stock. This means that a 2x4 is really 2" x 4 " and not 1 1/2" x 3 1/2" like you would find at Home Depot or Lowes. The frame and boarding is typically all rough sawn lumber, but can also be smooth or planed wood as well. Below you see the 1" x 12" pine boarding being applied to the post and beam frame of this 8' x 12' Cape style shed. The timber frame construction and barn board siding gives the interior a rustic look and a fills the building with a nice pine scent. The building below has finely finished trim work with a significant overhang and trim detail. It is sided with clapboard and roofed with red cedar shingles. This one was also built on a concrete slab. If you want a shed you can be proud of, choose a Cape Cod style post and beam shed. In the New England area? Need a Shed on Cape Cod? What size and type of shed do you want? Garden sheds & storage sheds. Cape Cod, Nantucket & Martha’s Vineyard sheds, barns & outbuildings.